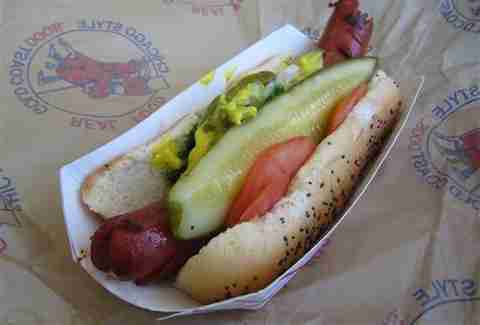 Is Chicago still a hot dog town? You’re more likely to see smashed-burger chains or healthy-eating places (whatever that is) opening these days. But who are you trying to kid? 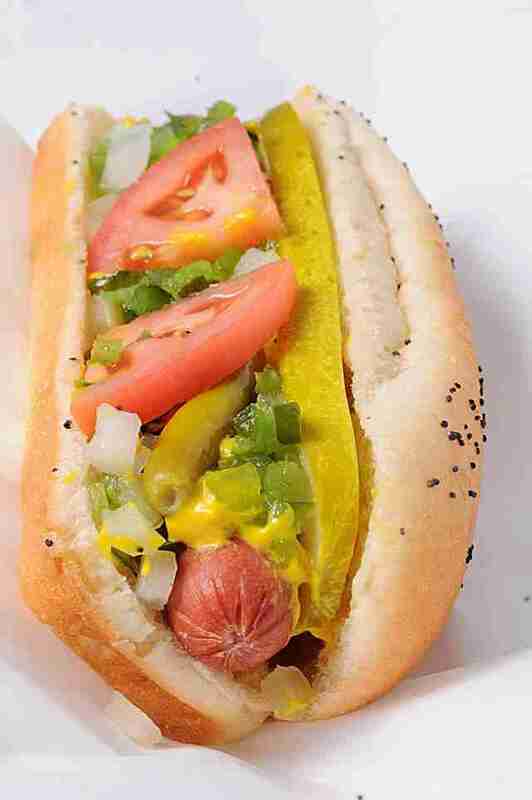 We’re still the greatest hot dog town in the country, plump Viennas and Red Hot Chicagos and Eisenbergs all nestled in steamed Rosen’s buns in practically every neighborhood and suburb there is. 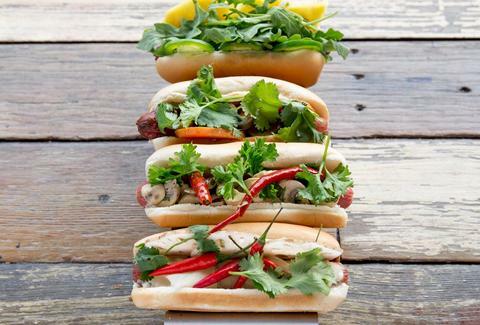 We picked them from all over the Chicagoland area, so you’re never far from a frankfurter feast. Unless it’s game day and you have a bleacher section ticket, Hot Doug’s is no more. But Doug’s old staff is still making the exact same dogs in this Uptown storefront. It doesn’t have his personality, but it’s good to know that his Thuringer (and more exotic things) live on. You know that Hot Doug’s high-meets-low cuisine spirit is strong in this one when you order your hot dog/burger/lobster roll/fish tacos with fries topped with a whole lot of foie gras. Once, Demon Dogs was the DePaul student’s hard habit to break, 'til the CTA invoked eminent domain on the beloved old stand, expelling it to Hades. Now this spot, near Lincoln and Fullerton, will tempt you with the standard items, as well as more exotic ones like duck sausage with foie (sounds familiar) and the Midway Monster (bacon and giardiniera). South Americans like to put crazy stuff on their dogs, as this new Colombian spot will demonstrate for just about $6. 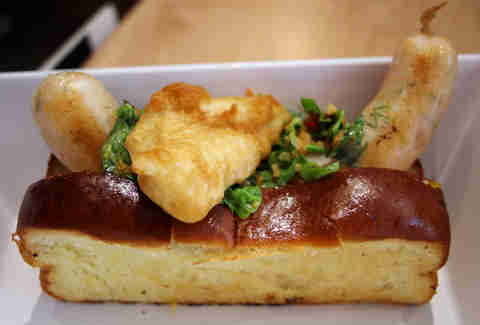 Its dog comes topped with cheese, crushed potato chips, quail egg, and about three different sauces, including pineapple sauce. Craziest of all? It’s kind of great. Tucked in a basement along Broadway, and run by a sweet older couple, this is the rare place that really makes Lakeview feel like a neighborhood. Get the extra-thick dog -- it's called the Chubby. The Western Ave branch of this small chain (it's restaurant bros with Wiener’s Circle and 35th Street Red Hots) only has minimalist dogs (mustard, relish, onion, and sport peppers), fresh-cut fries, and fried shrimp. Why would you need anything else, though? Formerly Phil’s Last Stand, it has plenty-good char dogs and fresh-cut fries -- if you can tear yourself away from the In-N-Out-esque burgers or grilled salami. Minimalist dogs, fresh-cut fries fried in lard, panhandlers, dodgy guys selling pirated DVDs... Jimmy’s is a true Chicago experience. 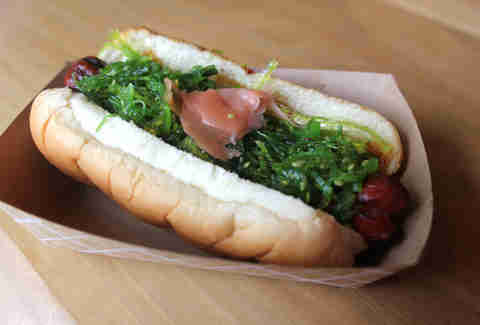 The sleepy northwest side isn’t where you go for culinary innovation, so it’s a surprise that besides perfectly solid dogs and burgers, this shop offers things like a Japanese hot dog (with seaweed salad and pickled ginger) or a Sonoran dog (green salsa, bacon, avocado, and about five other things). You won’t be sorry if you get one of the thick shakes (made with Homer’s Ice Cream), either. Tucked away at the very north edge of the city, this friendly “street food” stand offers classic dogs, burgers, and even tacos, as well as novelties like a habanero burger and a pulled pork burger, and last, but far from least, excellent fresh-cut fries. 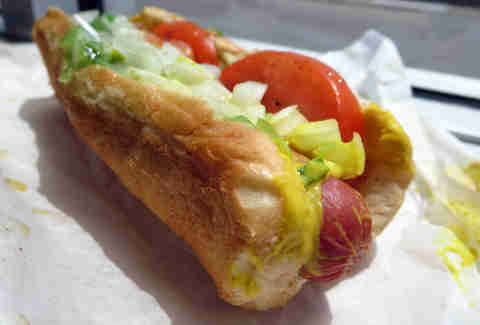 It's got pretty good Chicago dogs, plus a few more exotic things like the Cajun creole andouille dog. Chicago’s best drive-in restaurant has real carhops; fat, garlicky hot dogs; freshly cut crinkle-cut fries; and thick-as-a-brick shakes. CTA memorabilia (a lot more cheery than the actual Brown Line turnaround across the street) decorates this friendly, well-run stand, which serves a few gourmet-style dogs alongside the classics. There’s only one dog on the menu at this farm-to-fast-food place, but it’s a regular Dirk Diggler: an obscenely long, specially made kosher dog served with Mexican-style relish. It's got perfect minimalist dogs under a great '60s sign -- we just wish it had better fries than its frozen shoestring ones. 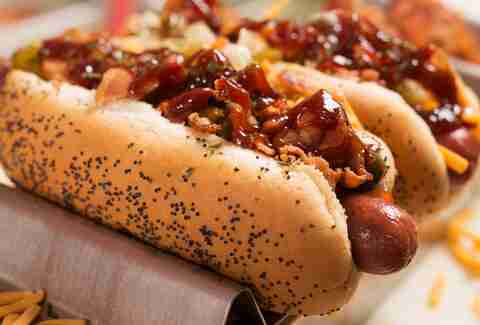 Seventeen dollars for a hot dog? 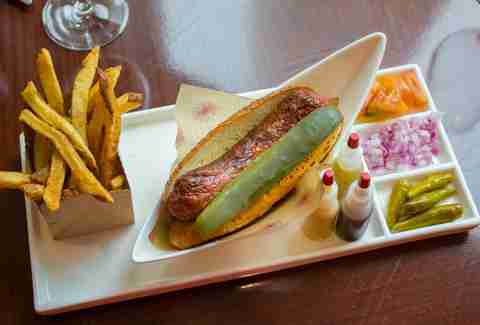 Maybe -- but only if it comes to your table with individual mini-squeeze bottles of house-made ketchup, mustard, and relish, and if it’s as good as this upscale hotel restaurant’s house-made dog. Yes, it’s a chain, but one that really did start in the blue-collar suburb of Villa Park back in the 1950s, and that turns out real-deal dogs to this day. You’d expect one of the last surviving workingman’s greasy spoons Downtown to make a good, classic Chicago dog (the kind with pickle, tomatoes, sport pepper, etc. ), and it does! This speedy Loop spot does classic Chicago dogs, but if you can take the heat, check out the Joey Dog, which piles fries and garlic-wasabi aioli on top, and dashes it all with Tabasco. 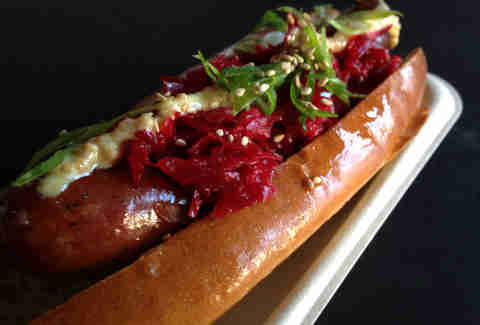 Bridgeport may be the home of hot dog tradition, but the fast-rising neighborhood is also the cutting edge of hot dogdom, with its Polish-Korean fusion dog (topped with house-made kimchee) at this stand attached to much-loved Maria’s Packaged Goods & Community Bar. If there’s anywhere you ought to find hot dog tradition unchanged by time, it’s in the shadow of the Sox, and 35th St is a living museum of vintage dogs like this one. Dating back to the old Maxwell St in the 1930s, this two-steps-below-no-frills stand takes you back to the primordial beginnings of Chicago dogs, and even better, the Polish sausage -- the 24-hour friend of the working man. We'd trade the skinless dogs for natural-casing Viennas, but otherwise, this friendly spot does a nice job with a Chicago dog and fresh-cut fries, along with other Chitown classics like gyros. Lots of places call themselves a “hole in the wall”, but Fat Johnnie’s literally is one -- it's a walkup stand that looks like it’s about to fall down. The David Berg kosher-style dog doesn’t have the spice of a Vienna Beef dog (even though it comes from the same company), but this is one of the few places you can still try a Mother-in-Law, the dogless tamale in a bun that folks in the Great Depression ate when they couldn’t even afford a Chicago dog. An unlikely place to find Doug-style gourmet dogs, perhaps, but this stand gives them a South Side spin, from the H-Dog with turkey chili to the Turducken Cobb Dog (topped like a Cobb salad). This guy's a 1950s-vintage joint in a new building in the shadow of the Skyway, still cranking out dogs, Italian beef, and Chicago-style gyros. A 1950s-era stand best known for Italian beef and Italian breaded steak, it's not surprisingly a place making a pretty good dog, too. Whatever you get, it’s all just to lay down a base for the excellent milkshakes, anyway. 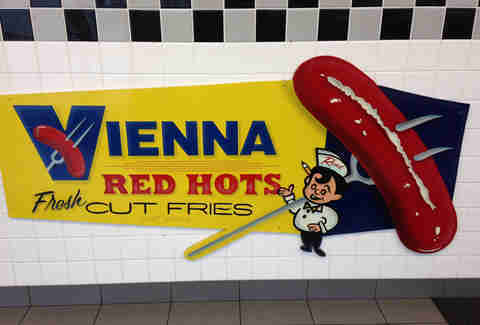 It's got the most genuine Vienna Beef dogs and fresh-cut fries in the southernmost point in the city. That counts for something, right? Allegedly founded when one of the owners lost his original stand at Polk & Western in a card game, this vintage stand draws lines out the door every weekend for fresh-cut fries and minimalist dogs. Forget all that tomato-and-pickle-on-top business, this is purely mustard, relish, onion, and sport peppers. If you dare to put ketchup on such a thing, you’re going to have to slink in shame to the McDonald’s next door for it. Bannockburn has a serious Ye Olde Scotland thing going, and The Dogout is located in what looks like a strip mall which was built to defend it against the Visigoths, letting you enjoy a solid dog while imagining the clans of Orangetheory and Sport Clips rising up alongside you to fight for FREEDOM! There are lots of hot dog stands that try to evoke the 1950s, but Rand Red Hots is the rare one that does it so convincingly that I had to look up how old it really is. Nope, it only goes back to 2013, but it’s an old soul -- the minimalist dogs, wrapped with the fries (contributing crucial mustard-onion flavor to your taters), could have walked right out of Gene’s & Jude’s, and the prices, if not 1950s-level, are at least highly reasonable. 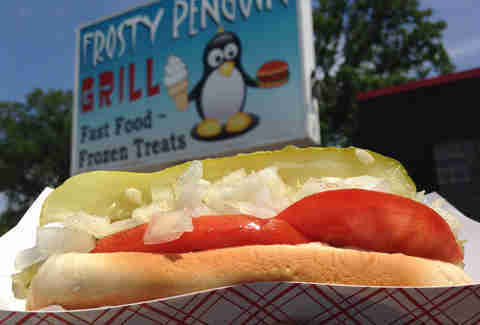 It’s hard not to smile on a hot summer day as you drive up to the penguin on the sign. The dogs are good, not great (they’re skinless, for one thing), but the soft-serve ice cream and the off-the-beaten-path location on a quiet stretch of Busse Hwy make you feel like you’re in a small town far from Chicago. Owner Brendan O’Connor truly runs the little stand that could. 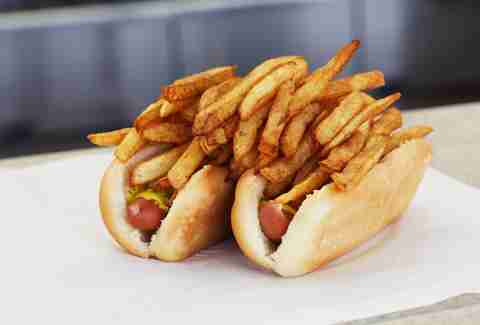 At Big Guys, which operates out of a former Parky’s (a local hot dog chain in the near west suburbs), you could have a fine Vienna Beef dog, or the hand-patted burger. But the best things here are the sausages, all made in-house, like the spicy smoked hot link or the bacon-wrapped cheddar brat. 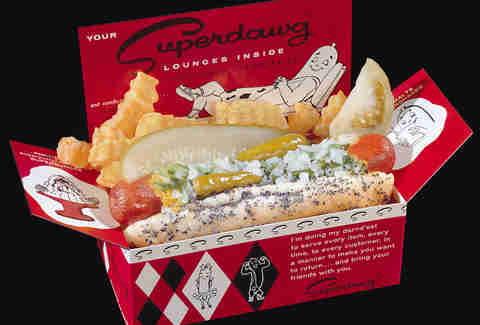 South suburban Alsip had a famous, Superdawg-like drive-in in The Frosted Mug, but it closed a couple of years ago. Trying to carry on the carhop-served, eat-in-your-front-seat tradition is this friendly spot, which occasionally has classic car meets. Mike Gebert is a James Beard Award-winning food video producer and writer, and the founder of SkyFullOfBacon.com. Follow him on Twitter @skyfullofbacon.